Who doesn’t need a new pair of earrings? Learn to make earrings for yourself or as gifts. Solid instruction on the use of jewelry tools will assist you in making three pairs of earrings. Two wirework skills will be practiced and used to make three pairs of earrings. The first skill is making a closed wrapped loop that allows you to make earrings and pendants. The second skill is making a closed wrapped loop inside of a closed loop, allowing you to attach dangles to chains. You will make earrings from Czech pressed glass, stone, fresh water pearls, and Swarovski crystals. No previous experience is necessary. Instructor: Cheryl Weatherford. Note this Bargain: Also sign up for Intro to Stringing on Jan. 19 and get double rewards points. 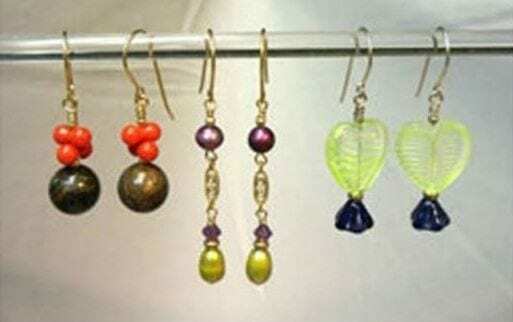 This class serves as the pre-requisite for the Delicate Dangle Earrings on Jan. 25.